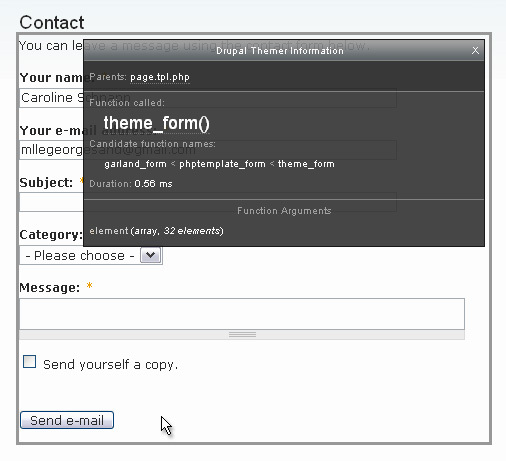 The following exercise consists in theming the contact form in Drupal 6. Once we're done, it will look like we'll have created two fall-back-on 'pages' for contact forms, one page/form to 'request a quote' at Randy.com/contact/quote, and an other page/form for general inquiries at Randy.com/contact/info. The trick here — if there's one — consists in theming the contact form differently based on the requested URI. use the Devel module function dsm() to inspect complex variables, such as Drupal forms. What theming function to override...? Does Drupal use my template? Is using template files such a great idea..? Context: You're having a bad day. Your ex-boyfriend wrote to you that he loves going down on women, while he never went down on you ever for the entire duration of the relationship, and you're developing yet another Drupal site for Randy.com. Randy believes he can give something back to the world. Doesn't everyone? On his new site, he wants to provide menu links to two different contact forms. One to 'request a quote', and another to ask Randy questions on whatever-else, like 'Randy, what is it you use to have such great hair?'. You're in luck because in core there's a module to whip out a contact form — and validate it and send you its submitted content by e-mail. This module produces only one contact form, with a 'select an option' drop-down list of 'categories'. For each of these categories, you, the admin, can specify a different e-mail as the destination for the form's submitted content. After some theming magic, it will look like you'll have created two different forms. But you won't... ah ah ah... After your magic touch, it will look like you'll have created two Drupal pages... but in truth (shhhh...) you definitely won't. Your site will behave as if, and that's all that matters. To check if your contact module is enabled, try and access the page admin/build/contact/add, or look for 'Contact form' under 'Site building' in your Admin menu. If you land on the 'Site building' page, you have to enable the module. Head over admin/build/modules. When you're done, you'll be redirected to admin/build/contact. Place your cursor over the 'edit' link next to your category. This link will point to admin/build/contact/edit/x. That number x is the cid of your category (contact hi-dee). Take mental note of it. Create a 2nd category for general inquiries, with its own e-mail address, etc. You will end up with two categories. If you had created categories before and deleted them, the 'cid' counter has never been reset (it never is), so you may add categories with, e.g., cid 32 and 33 (or 65 and 66). That's fine. Take note of the 'cid' for general inquiries. So, now, you want to theme the contact form. That's your goal. The first question you ask yourself is What theming function must I intercept and override? To find answers to these types of questions, 11heavens.com recommends using the module Theme Developer. Download the Devel set of modules from Drupal.org, extract it to sites/all/modules, and enable the Devel module on your admin/build/modules page. Make sure to move the Development block to some active region on your page. 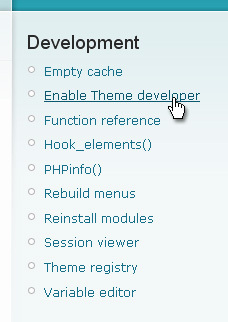 Once you've landed on the contact page, click on the 'Enable Theme developer' link in your Development block. You want to click on the form, but you end up selecting one field or another within the form. Argh. Solution: click somewhere to the right of the Send e-mail button. There's no specific theming function that's been registered to theme the contact form. How do you know that? The function theme_form() is used to theme the form. How do you know that theme_form() is used to theme the contact form? The Themer info widget tells you that. Take a look. See it? 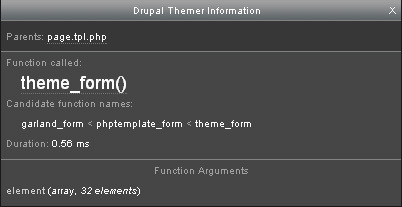 Function called: theme_form(). You're not interested in overriding the theme_form() function. You want to theme the contact form. You do not want to theme all forms on Randy.com. You want to theme only that particular form. What will you do ? You will register a theming function for the contact form. Modules and themes can both register theming functions. Modules and themes can both implement the function hook_theme. To register a theming function for a form, you must know its Form ID. There are at least two ways to find the Form ID. Look at the <form> id attribute (using Firebug). That id happens to be the hyphenated version of your Form ID: <form action="/contact" accept-charset="UTF-8" method="post" id="contact-mail-page">. Hence, the Form ID, here, is contact_mail_page. Replace each hyphen of your id attribute by an underscore and you've got your form ID. Just for fun (and to learn a few things), you take a peek inside the contact module to make sure that it provides no theming function for the 'contact_mail_page' form. You're looking for the module's implementation of hook_theme(). In the modules/contact folder, you search for the string function contact_theme. The module is registering no theming function. Most core modules register their share of theming functions. The contact module is quite 'exceptional' in that regard. For the sake of learning something about HOOK_theme, you'll look at another module's implementation of the hook. Open the file modules/user/user.module and look at lines 30-78. When the module provides a theming function per se, a 'file' is specified, the file in which the function is defined — but the module does so only when the function is stored in a separate file, that is, not in user.module. Whenever the module provides a *.tpl.php file, a 'template' is specified. The template name, as the convention goes for a form, is the hyphenated version of the Form ID. You take mental note of this. In the hook_theme() function, the key to each sub-array is the internal name of the hook. And we mean hook in "themespeak" (theme parlance), not "modulespeak". For a form, the name of the hook is the Form ID. Each sub-array contains info about said hook, and that info is an associative array. Among the info, there's only one required item to provide, and that is the 'arguments'. Plural form. So, now, you'll register a theming function for the contact_mail_page form. The contact module hasn't done so. So, you will. The hook_theme function always returns an array. It returns an array even when it registers only one single theming function. The hook_theme function returns an associative array. In that array, the key(s) is(are) the hooks (in "themespeak") that need to be themed — and for a form, the hook is the Form ID. The 'arguments' element (plural form, please!) is also an associative array, and it is an array even when it contains only one element. The key/value pair for that one element, in our case, is 'form' and NULL. You could provide an 'arguments' element, and stop there. 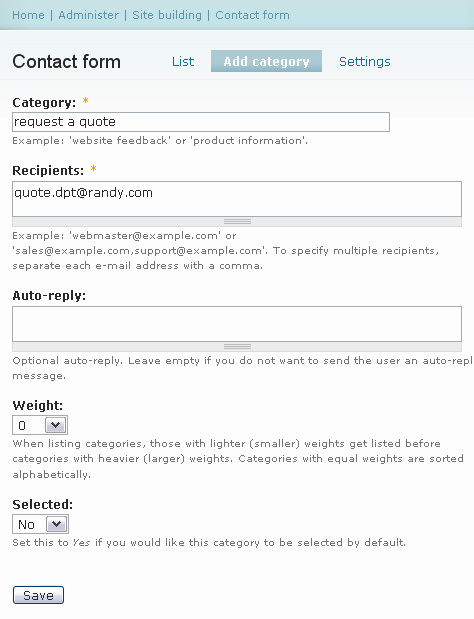 You could then use a function like garland_contact_mail_page($form) to theme the form. But if you prefer to use a *.tpl.php file to theme the form, you need to provide a 'template' name. The value of 'template' is the name of the file you intend on using — without the tpl.php extension. Note that the template name can be ANYTHING AT ALL, that is, 'anything-at-all', provided you create a file that's called anything-at-all.tpl.php. But to follow Drupal's coding conventions, you, my Drupal-worker friend, use the hyphenated version of the Form ID. When you want to override a template provided by a module, the process is the same, always. You locate the template file and copy it to your theme folder. When you want to pass additional variables to the template, you define a preprocess function for the template in your theme. That second step, however, is optional. It's usually not needed. Create the template file out of thin air. Define a preprocess function to pass along to the template file any variable that it needs; all of the variables that have not been passed along already through the 'arguments' defined above; all of the variables it needs except the ones passed along already; all of the variables it needs excluding those variables that are automatically made available to all template files, like $user and $logged_in. (For a list of what's available in ALL *.tpl.php file, head over here). By the way, are you still using global $user; in your template files? Just use $user, it's a default baseline variable available in all *.tpl.php files. It's part of your free meal. For each template file used to theme content in Drupal 6, there must exist a function to pass to it whatever variables are needed to output content. For each template file used to theme content in Drupal 6, there exists somewhere a preprocess function. The function garland_preprocess_contact_mail_page(), as defined above, creates a new variable and passes it along to the template file. That new variable is $form_markup, and it contains the markup for the form 'contact_mail_page'. In $vars, the key $vars['form'] is set, as well as the keys for the default baseline variables available to all templates. $vars['form'] is a complex nested array that contains our 'contact_mail_page' form. $vars is passed to the preprocess function 'by reference'. This means you can add to it, edit it, do whatever you want to it, and your changes will 'keep'. The preprocess function is usually used to pass additional variables to the template file — by adding to $vars — but it can also be used to change the value of stuff that's being passed already. You'll use it that way. The drupal_render() function is what's used by themes to whip a $form array into XHTML markup. The drupal_render() function can render any part of a form, or the whole thing. When used to render the entire form, drupal_render() will only render these parts of the form that have not been rendered yet. It can keep track of what has been rendered thus far, in other words. Clear your Drupal cache. That will clear the Theme registry. Satisfied and relieved, you remove the 'So you would...' paragraph from the template file. So you want to produce two 'fake' Drupal pages, each one displaying a different version of the contact form, a version tailored to suit the context of a quote request, and another one to suit the context of a general inquiry. You will create 2 files, one for each 'variation'. You'll name the first template file 'contact-mail-page-quote.tpl.php' and the second one 'contact-mail-page-info.tpl.php'. Make two copies of your contact-mail-page.tpl.php template, you'll work from it. Modify the names of these copies, and change their content. Only contact-mail-page.tpl.php is 'seen', so far, by the theming engine. You'll change that. In the URI http://Randy.com/contact/quote, 'contact/quote' is $_GET['q']. Although it is a path that leads to nowhere, it is still something you can read. To read what's contained in the q value, you will use the Drupal function arg().This function breaks down the Drupal path into its components. Components of the path are separated by a forward-slash. For the URI http://Randy.com/contact/quote, arg(0) is the 1st component, ie: 'contact', and arg(1) is the 2nd component, ie: 'quote'. You will read the second component, and will suggest a template file based on it. You are suggesting one template file for each case by using $vars['template_file']. You assign to your 'suggestion' variable the name of the *.tpl.php file you plan on using minus the extension. Just like you did in your implementation of HOOK_theme when you told the theming engine to use 'contact-mail-page', which effectively points to the file contact-mail-page.tpl.php. Now, you're thinking about how you want to render or display the contact form for each situation, the 'quote' situation and the 'info' one. In both situations, you do NOT want to show the drop down selection for categories. A category is picked based on the requested URI. The URI already informs us as to what category was chosen, in other words. So you'll hide that element in the form in both cases. For that you'll use CSS display:none. However, when the form is submitted, that information about the cid will be missing, so you must 'fill in' that form field behind the scenes, on behalf of the visitor. This is something that you can do in your theme. The values you'll assign here to $vars['form']['cid']['#value'] are the Contact Hi-dee you had 'memorized' previously. So they may not be 1 and 2. 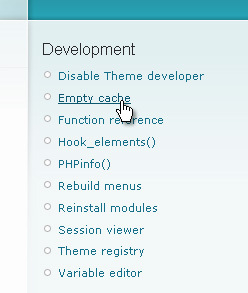 Clear your Drupal cache, to clear the Theme registry. Then, head over to the 'contact/quote' page. What do you see? Test the 'contact/info' page as well. dsm() or dpm() Any variable In a message Yes, perfect for all. dvm() A complex variable, such as an object or array In a message No. Ugly print. dpr() A complex variable, such as an object or array At the top of the page. Yes. Perfect for complex, ie: nested, objects and arrays. dvr() Any variable At the top of a page. No. Ugly print. To inspect complex nested arrays such as forms, you can use either dpr() or dpm()/dsm(). These functions pretty-print forms either at the top of the page, or in the 'message' area. dpm() and dsm() have the same behavior. In the 6.x-1.8 version of the Devel modules, dsm and dpm print the content of variables at the top of the page. That's a bug. The m in dsm and dpm means 'message' — it uses the function drupal_set_message(). You now want to modify the field labels in the contact form. The paragraph that contains 'You have an inquiry...' can certainly be added to the form as a markup field. At the theme layer, one can still add additional fields to a form, even though they will not be validated, neither submitted. They will be added just for the 'show'. You can also wrap the form within a div with a specific class name, using $vars['form']['#prefix'] and $vars['form']['#suffix']. That way, you can take care of supplying the form with a CSS class name of contact-for-general-inquiry. Then, you go ahead and comment out the whole preprocess function. Preprocess functions are for template files only. Preprocess functions are for template files only. This is a contrived example of course. This is an exercise. You may wonder why in the hell you ought to add some 'intro' text field when the form already contains a 'contact_information' field. I am doing this just to show you how to add a field to a form. To place text in a form is not exactly adding a field to it. But still, in the world of Drupal Form Theming, markup that just sits there to be read is a field in its own right. Strange, hein? Text that just sits there is even the default type for a form field in the Drupal form API. Hence, you need not specify a '#type' of 'markup' for the new $form['intro'] field. To be fair, this field (in Drupal form-speak) can consist of any markup. Don't forget to clear the cache. Now head over to your 'contact/quote' page. All you have left to accomplish now is go to admin/build/menu and add menu items that link to contact/quote and contact/info, and then add these menu items to a menu, e.g. your primary links. And you're done. Randy is happy. He sends you two-thirds of the money he promised you, along with this photo of him. He says he's on the left. [Or did you just want to show an alternate method]. merlinofchaos said so during a screencast presentation on theming Drupal 6 theming: an overview of the changes to theming in Drupal 6 for which you can find the slides here. Even if it'd be five times slower it would still be very quick, but that 'slowness' is the reason why Drupal will never provide templates to theme these 'hooks' that you can find by the dozens on one page. For example, you will not find a template to theme 'menu_item_link' or 'menu_item' or 'links' or 'more_link'. The rumors have it that Drupal core will provide even more templates, to copy and drop in your theme, for Drupal 7, but it won't provide templates for these hooks for sure. But you're absolutely correct. Although I personally prefer using a function here over a template file, I _really_ wanted to show both ways. One may not perceive any difference in speed here, at all. Generally, I prefer to use a function when all that the template does is print the content of a single variable. I thought I should mention in passing that there's a contributed module to create forms as nodes. After enabling the module, you have one more content type at your disposal, webform. Each time you create a 'webform', you end up with one node = one form. Each form has the attributes of forms as we know and love them, it has its own Form ID, so you can theme it, etc. And the webform is displayed in a node, so it has the attributes — and ADVANTAGES of nodes. While you create a webform, you're presented with an E-mail to address field, so that submitted content for that form will always be sent to that an e-mail address, just like for the contact form. You can show two of these nodes/forms on the same page like Laurence does on his contact page. 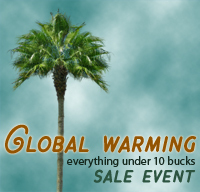 Check it out: http://lhmdesign.com/contact. The webform module has a beta version for Drupal 6, so it's all lookin' and lickin' good for its lifespan. The project page for that module is at http://drupal.org/project/webform. This module is also good for questionnaires, etc. Really usefull module if your not in the mood to setup CCK fields and a entire new content type for each little thing. I'm sure you could even use this as a nice contact module replacement. That's how I discovered the existence of the module. I was on a Drupal site, filling a contact form... there were 2 different contact forms on the same page, and that picked my curiousity, so I did a View Source. I saw 'webform' in the class names, and googled that. Just to clarify -- the garland_theme() function goes in the module's .module file, not the theme's template.php file. ALSO, this function is only called when the cache is rebuilt (so after you click "Clear Cache" from the Devel sidebar) -- it does NOT get called upon each page load. This was driving me crazy and I couldn't figure it out until I ran through everything with a step debugger. Thanks for the great article -- this is the only place on the entire web (AND in all the drupal books) that I found an explanation for rendering a form with a template. Whatever extra load time results from doing it this way is worth it to me, because we have web designers who create HTML and hand it off to programmers -- trying to put that HTML into a php function would be a nightmare. Just to clarify -- the garland_theme() function goes in the module's .module file, not the theme's template.php file. Not at all. We're not writing a module here — and you certainly should not touch core. The garland_theme() function goes in the theme's template.php file. I even provide a screenshot. I love your articles. Thank you! Note: After 10 attempts to format this comment with <code> and/or <?php tags, none of my Previews looked 'pretty.' Sorry if it posts that way, too. I am so sorry about the filter... argh. I will fix this. I would love to see something like this for the comment form. I tried a similar approach with the comment form, following this and the Drupaldojo video and it for some reason nothing worked. I can call another template but cant seem to output any variables in it (it does get called and I can print a simple bit of html and message, but all the form fields fail to render). dsm outputs nothing, drupal_render($form); outputs nothing. When I use the devel theme developer it gives me no candidates for functions. Is the comment form somehow different? how can I theme the comment for radically different than the default? I want to re-order all the fields and use a lot of additional markup. Thanks for the great tutorial - I just wish this would work for the comment form also. I've searched high and low for advice, but no one seems to have posted any info on theming the comment for in this way as yet. Is there something else I need to do to get it to work on CCK forms? Did you make the myGarland theme your new default theme? Did you guess what the form ID was, or did you check the source..? What does Themer info say now...? What function or template is used now to theme the form? I suppose uncommenting the dsm function call does not result in the form being output to screen? Thanks for the feedback, Remy. Very appreciated! 1) Yes - I did. 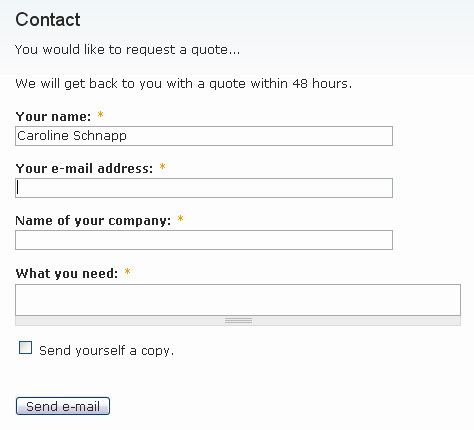 Went through your tutorial for the contact form and that worked fine using both methods outlined. 3) Themer info actually showed myGarland_front_page_node_form as candidate function names. Hope you can help - I am about at my wits end. In case it helps, I've also logged an issue on drupal: http://drupal.org/node/316672. Themer info actually showed myGarland_front_page_node_form as candidate function names. Function name? It should precisely give you the name of a template to be used. You should perhaps avoid using capital letters in names of folders/files (and PHP function names). Bad practice that may also cause problems with Apache along the way. Do you think perhaps using capital letter 'G' is the problem? Can you show me a screen capture of what Themer info shows for the node form? You can upload the screen capture to the Drupal support request issue. I've uploaded the screenshot of my theming info to the support issue on Drupal - http://drupal.org/node/316672. Hope you can help. Catching up on differences of Drupal 6 and 5 for a job interview tomorrow when I came across your site and this write up. The write up is excellent both in technical clarity and entertainment. Your content and banter remind me of a more technical Annalee Newitz. Your content and banter remind me of a more technical Annalee Newitz. That is a great, great compliment. I would like to format some content types that contain CCK fields in the same manner, Is that possible? I can't seem to find any unique identifier between the forms that would allow me to format one seprate from all the other content types on my site. They all appear to have the form id "node_form". Any help is appreciated. I was a little premature on my previous post, I hunted around a little more and found the possible function names. By the way, I ran around your site for a while. You are very talented. and I don't know why I can't override the ['field_first_name']? Any help is apreciated. Ok well, I feel like I've taken over your comments, sorry about that. I was able to resolve the issue using the dsm($form). it turns out that the field I was testing on had PHP code in the cck default field to help pull the users name if they were authenticated. Consequently the [#title] field under the field name was being superseded by a nested ['#title'] field way down in the fields nested arrays within the default values. Just a very minor comment, that dsm() is actually identical to dpm() ... see http://cvs.drupal.org/viewvc.py/drupal/contributions/modules/devel/devel.... Might be worth clarifying this in your useful table above. Yeah OK I'm splitting hairs; it was that when I saw this table I had the feeling 2 were the same but it wasn't immediately obvious which without checking the devel.module source :O . These days dpm() seems to be the preferred form. I will make it more obvious. 1. You are awesome. That is not my "humble opinion," (do I really even have "humble" opinions?) but a direct observation of fact. This may be the very best tutorial I have ever encountered, anywhere, on any subject. And that's without factoring in the wit and humor. If you're not already receiving two ridiculous FT salaries, one as a Drupal guru and the other as a documentation genius, you should be. 2. In terms of hiding certain form elements without removing them from the form, wouldn't it be easier to set '#type' => 'hidden' (versus wrapping in a new div in order to set visibility:none; )? This might be easier, especially in more complex scenarios. If you're not already receiving two ridiculous FT salaries, one as a Drupal guru and the other as a documentation genius, you should be. I am most definitely not. I like to write (can you tell? ), even in English, which is not my mother tongue. But never made any money with that. Packt Publishing did contact me with a proposal to publish all my tutorials in book form. Packt Publishing prints its books on demand, with a low quality print. If I ever did publish anything, it would either be with a company that provides excellent technical review, and nice quality print, (and money) or I would create the PDF in InDesign and take care of the print myself, that would at least cover some of my living costs while writing. Your array_merge solution is excellent. I realize that I am not really a PHP programmer, I know the Drupal framework very well, and tend to not think of PHP-only solutions often enough... I am learning Ruby on Rails now, by the way. And I do intend to be a Ruby kung fu. Love it! Thanks for everything, you made my day, Chris. "Parse error: syntax error, unexpected T_VARIABLE in /home/lund/www/www/sites/all/themes/zen/lund/template.php on line 103"
I'm a novice trying to make this work. Thanks. Do not use “garland” in your function name, use your theme's name instead. Make sure that there isn't such a function declared already. If there is, just integrate the code in it. When I use the name of my theme, I get the same fatal error Unexpected T_Variable as soon as I put that function in. The function is not declared elsewhere, the site is a simple install. My theme is a Zen subtheme. But what about theming the submit button? This is a great tutorial. I loved the comment about getting something to eat first (good advice). I'm running into trouble trying to change the text on the submit button to something reasonable. I've created a content type "message" using CCK. It has two buttons by default at the bottom of the form: Save and Preview. I want to leave off the preview button, and change the Save button to send. I've tried changing the value of the submit button in the preproccesor function in template.php but it doesn't seem to work. but it doesn't seem to work. Do you have any suggestions? Depending on either creating a template file or doing it all in your own theming function. You will want to access $vars['form'] in the preprocess function. Also, please use the Developer module to examine the content of your form variables, that is, use dsm(). Don't shoot in the dark. Seeing it is nailing it. Very good tutorial, it's exactly what I would like to do except that my site is multilingual and i would need to translate, let say, the 'So you would like to contact us...' sentence in your example. I was expecting to find the sentence So you would like to contact us... in the strings to translate search section of the i18n module, but no success! Do you have a clue on how to do this ?? I'm new to Drupal this tutorial looks and reads great but I'm not sure where my template.php file and .tpl.php files are supposed to go. Tried them in my sites/all/themes folder and in sites/all/themes/garland and even tried dumping them into themes/garland 's template.php. Just copying and pasting exactly what you have. Help would be awesome. I'm using Drupal 6 (just incase that was the first response) on a base install that has only had devel, admin_menu and the contact module turned on. But it doesn't show me the altered form in the first part of the tutorial. Sorry I'm such a newb. I didn't know it was okay to copy garland theme to my themes folder. Works fine. Amazing article. It helped a lot for me to customize the contact form. Awsome work!!! I am a newbie to drupal. I don't know the basics of drupal and this article saved me lot of time. So everything was fine until I started to dump the template files and use function to do the job. Here is my code to register the node ID (wowstory_node_form). Because the zen_theme() function already exists, I had to insert the code inside those irrelevant stuff. My current theme is called neuromods and am using zen as a base theme. When they are both in template.php, my homepage can not load(other page still can open). I thought I followed every step and can't figure out why. Ohh, also could you please share a broad concept of how to redirect a submit button? I am trying to make a submit form which can slide open/close on homepage, and when users click the submit button, I want them to see the success message in the same block, not another page. Thank you very much! Hey, After reading this article I got the dsm() function working and I've loved it. However, I'm using the Content Profile module to put CCK fields into my registration forms and I can't seem to get the dsm() function to show any information about those fields. Any suggestions? Good post, thanks. Will recommend to Randy. I themed the form to have the small fields on the left and the message field on the right, among others. Was so glad to find your text! But do you have any tips on how to change the size variable of the input fields in the contact form??? All the information I found on the Drupal website about this had to do with the hook function and modifying the size variable in the HTML. The CSS solution works just fine. Thanks a lot! And happy holidays to you too! Your Tutorial proved usefull to me.Thanks to your tutorial I have saved a considerable amount of time in theming the contact form.For first I was considering overridding theme_textfield to change the label of the contents of the form.But, this is much easier. I love your work and look forward for more work from your side. I am a regular visitor of this site and by now have suggested many people. do not try to bend the spoon. Use the hook. I guess learning actually can be fun! Really enjoyed reading the article. Thank you. First; I love your blog and witty writings! Second; I'm finding myself completely stuck right now trying to theme a webform node based on this tutorial, and wonder if there are any mayor differences in approach that I'm oblivious to. I'm working with an extension to the Zen theme and am trying to add a hook function for a webform (form id=webform-client-form-8 from generated html-code). This isn't picked up by the theme engine, which uses the standard theme_form() and webform-form.tpl.php still. Uncommenting the .tpl file and adding a preprocess function doesn't yield results either. Cache has been cleared. // function isn't used to generate the output. I assume the problem is that contact module does not create a block like it does for page in its hook_menu. So i wonder is there any way to create a contact block without changing code of module. with using the theme developer of devel i can confirm that the #default_value has the value which i set. but the value is not shown on the form field. I've been intensely immersed in Drupal 6.X for the past 6 months and having a great time. Just wanted to say that this is THE Best, well written article on anything I have yet read with respect to Drupal. I hope you write a book. This is a very good Drupal tutorial, very clear and complete, thank you very much ! This is very clear and good post.Any body can easily understand a process of theming and module. Everything extremely well explained here, thank you so much for this, I got my contact form in no time at all!